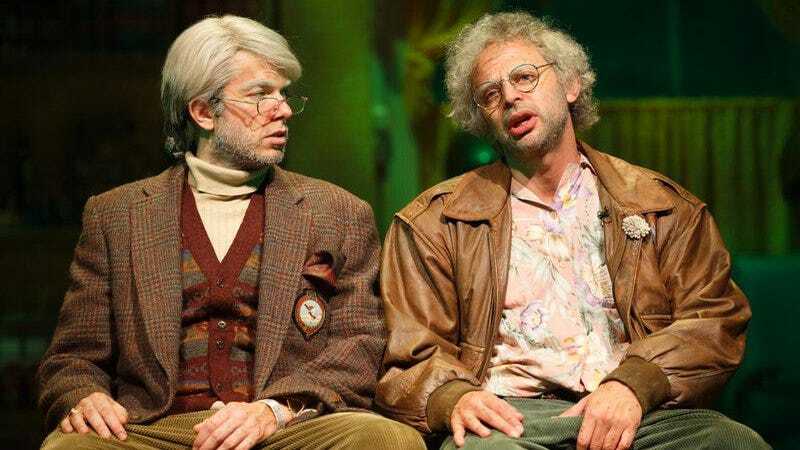 When Nick Kroll and John Mulaney created Gil Faizon and George St. Geegland at a little nightclub on New York’s Lower East Side, they probably didn’t think that, a decade or so later, they’d be portraying their lovable idiots on Broadway. And yet that’s what happened last year, when Oh, Hello made its debut on the Great White Way to rave reviews. That theatrical turn has now been translated into a new Netflix special, Oh, Hello On Broadway, which is out now and which we called “a singularly funny testament to Kroll and Mulaney’s creative partnership and personal friendship.” We talked to Kroll and Mulaney about that friendship, and about where George and Gil’s odd brains have taken the duo over the past few years. The A.V. Club: We occasionally do a feature here where we ask comedians and comedic actors what makes them laugh. What makes you two laugh, and what did you use as inspiration for Oh, Hello On Broadway? John Mulaney: There was this 60 Minutes feature on Kim Cattrall and her then-husband a few years ago where she claps to him playing upright bass. That was a big influence on us. JM: He laughed in rhythm. The video’s called “Kelsey Grammer Stand Up,” and only half of that title is correct. NK: It’s a song that goes [Both sing in unison.] “Ha ha ha ha ha ha / Laughing in rhythm.” That’s a big influence. NK: Raccoon videos, whether they’re eating green grapes, or stealing cat food. NK: Steely Dan was definitely around. NK: Outtakes from The Jinx that we’ve gotten our hands on. AVC: How did you get outtakes from The Jinx? JM: He gave us some. And…. [Pauses.] You know. Charlie Chaplin. The first guy to ever do comedy. AVC: When you were putting together the Netflix version of the show, how did you decide what you wanted it to look like and how you wanted to actually capture the play on film? JM: Michael John Warren directed the film and Alex Timbers directed the play. They worked together on it, and what we were going for. We said, “Let’s try to get the frenetic, weird energy of the play” and how loud and crazy it was in wider shots. Let’s also go in very close and hopefully get the amazing lighting and the amazing set. We had some of the most gifted designers working on the Broadway show and we wanted to have coverage that you wouldn’t normally have in a play that you see on PBS. NK: Obviously, it’s a play within a play. As George and Gil turn on each other within in the play, you start to get inside what’s happening on a more intimate level. JM: We wanted the camera to get as close as possible. NK: We’d watched all different kinds of versions of these things, and the ones that were more effective for us were teleplays. JM: Playhouse 90 was pitched like a play but shot as close as you could. And then the Hamilton documentary was amazing because it had the width and the scale and the performances, but then you would follow an actor from the wings onto the stage. So you had this vantage point that the theater audience doesn’t have, but it shows you the full size of the play. You don’t want to lose either. You don’t want to lose what the audience would have seen, but you also don’t want to lose what we got to see being up close to it. AVC: Not to spoil anything, but you also got a terrific performance from Matthew Broderick performance for Oh, Hello On Broadway. JM: Yeah, that was big for him. NK: Big break for him. AVC: What did you guys do differently on the night that you shot the show? JM: We worried a lot more. We were more in our heads about having done this for 10 years, and knowing this is the one that everyone will see. NK: You know, John’s serious, but he’s also being serious. JM: I’m serious, but I’m hoping it’s charming. NK: I feel like when you do a live show like that every night, it changes and you don’t want to lose the spontaneity or the feeling that you had on each individual night. I think we were able to find and capture it and convey a feeling of, “That’s what was happening on that night to that crowd.” We were able to put something together that felt like that. AVC: Do you know how many total shows you guys did? JM: We did 138 shows on Broadway. We did about 100 between off-Broadway and our tour. AVC: What did you learn over the course of doing all those shows? NK: John didn’t know he was allowed to wash his pants on Broadway. NK: What is your superstition? JM: I’m terrified of the audience hating me. NK: That’s not a superstition. JM: Oh, it isn’t? I won’t pee the week leading up to the show. AVC: Nick, did you learn anything? I’m assuming you knew about the pants thing. NK: Oh, I knew I was allowed to wash my pants. And, by the way, they were still a good audience. We were just spoiled. Anything that wasn’t like Queen: Live At Wembley Stadium, we were disappointed in. But that was a good lesson. “If you believe in the play, even if it takes them a minute, the audience will believe in the play.” They have to believe that this story is important to these people. AVC: You guys are obviously proud of the show, but are you happy to be done with Gil and George for a little bit? JM: As Gil and George. We’re never done doing Gil and George. It’s the most fun thing to do. JM: There was another play coming in, so we closed, but we would have kept going forever. NK: The dream has been fulfilled. AVC: Does that stuff pop up in your guys’ lives at all or can you keep those affects totally separate? JM: We talk in those voices all day long, every day. NK: It’s our default to talk to each other in those voices, so it has become a truly second-nature thing. So, whether we’re doing the show or not, we’re doing George and Gil. I think our plan is to slowly do George and Gil until we’re their age. JM: That’s when we no longer get why it’s funny.